Vacation and accommodation in Greece is a complete Travel Guide for Greece. In Vacation-Greece you will find information on Greek islands and a list of Greek hotels, studios, apartments and villas for all budgets. In just two steps you can find hotel offers in Greece, see maps and photos of Greece, book flights, ferry tickets, discover Athens, book guided tours, ancient theatre and museum tickets (delivered to your home address) and make hotel reservations. Greece lies in the southeastern Europe and is also known as Hellas or Hellenic Republic. Gavdos, the small island in the south of Crete is, in fact, the southernmost part of Europe. Greece has a population of approximately 11 million with some 5 million of which residing in Athens and the nearby suburbs. Politically, Greece is a democratic state, with a parliament of 300 representatives and the president of the country at its head. Greece is part of the Balcan peninsula and, apart from its northernmost region, most of its coastline is surrounded by the Mediterranean Sea. The terrain morphology is such that some hundreds islands and islets are formed in the Ionian and the Aegean Seas. 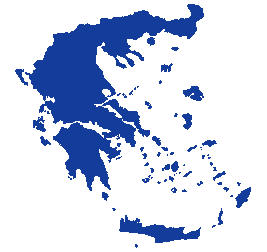 The country is divided in several districts, each having its own prefectures as well as several groups of islands in the Ionian and the Aegean Sea.